The color pink isn’t normally associated with violence, unless you’re one of pro-wrestling’s Hart Family – or jockey Javier Castellano, who wears pink silks when he’s riding the horse named Violence. This Kentucky-bred dark bay has muscled his way to the front of the line in each of his three races thus far. This is yet another outstanding juvenile horse for trainer Todd Pletcher, who also guided Shanghai Bobby to an undefeated 2-year-old campaign. Violence’s versatility is impressive, winning at three different tracks on two different surfaces. The way he tracked down frontrunner Fury Kapcori from the middle of the pack at Hollywood Park is a very promising sign for anyone betting on the Kentucky Derby. Like most new 3-year-olds, Violence has yet to be tested at longer distances, but his pedigree is very promising. 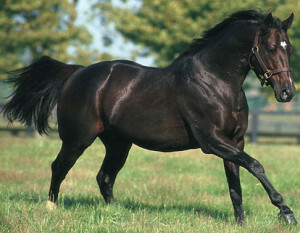 Violence was foaled at Dell Ridge Farms on March 21, 2010; his sire was Medaglia d’Oro, who finished fourth at the 2002 Kentucky Derby and second at the 1.5-mile Belmont. Medaglia d’Oro also won six graded stakes and finished second to Pleasantly Perfect at the 2003 Breeders’ Cup Classic. Very nice, but the eye-opener is on the dam’s side. Violent Beauty won her maiden in her fifth attempt in 2006 and raced twice more before hanging them up – always nice to have a mare with at least one win under her saddle. The real selling point is her own pedigree: both her sire (Gone West) and her dam (Storming Beauty) were the products of Secretariat mares. In case you’re new to the game, Secretariat was the 1973 Triple Crown winner. This particular mix of genes (with the appropriate amount of inbreeding for a thoroughbred) has produced a horse with the talent and the temperament of a world-class champion. Ironically, Violence has a fantastic demeanor with a fluid and seemingly effortless gait. He did have a moment or two of discomfort at the CashCall Futurity, but got the victory nonetheless. Because of that famous pedigree, Steven Marshall and California-based Black Rock Stables had to shell out $600,000 to purchase Violence as a yearling. Marshall made his first big splash as an owner in 2011 with Silver Medallion, who took first place at a number of Grade 3 events including the 2012 Fort Lauderdale Stakes – also with Castellano on board wearing a bright pink number. Pletcher will have to choose wisely on the Road to the Kentucky Derby to make sure his horses qualify with enough points. He’s already indicated his preference to give his horses two prep races and only two; Violence is likely to appear at the Grade 1 Florida Derby (100 points to the winner), and is also reportedly being considered for either the Grade 2 Risen Star Stakes or the Grade 2 Fountain of Youth Stakes (50 points).